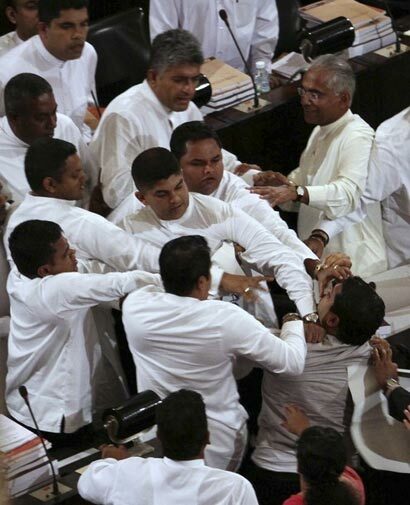 Speaker Chamal Rajapaksa yesterday stated that an investigation will be held in connection with the unacceptable behaviour exhibited by some Members in the House during the budget speech by President Mahinda Rajapaksa on Monday. He made this observation in response to a point of order raised by UNP MP Jayalath Jayawardena before commencement of the Orders of the day. The Speaker also stated that stern action will be taken against those who crossed the well of the House on this occasion. The Speaker further stated that nobody could be allowed to bring posters, banners or any other unauthorized material into the House. He also stated that privilege matters should be raised after giving notice to the Speaker. Irrigation and Water Resources Management Minister and Leader of the House Nimal Siripala de Silva endorsed the Speaker’s decision to launch an investigation into Monday’s incidents and stated the government would extend its fullest support for such an investigation. The minister also stated that the UNP should take full responsibility for the unacceptable behaviour in the House during the presentation of the budget proposals. Minister Nimal Siripala de Silva further stated that a conspiracy was hatched by the Opposition to defame the President and to disrupt the business ofthe House during the presentation of the budget proposals. He said not only the Opposition Members but the Members of the government side were checked when they entered Parliament. It was the responsibility of the security personnel to provide security to the President. UNP MP Jayalath Jayawardena raising a point of order connected with his privileges said that he was checked at the entrance.